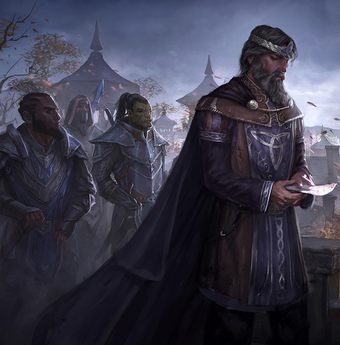 The Daggerfall Covenant is a major faction in the upcoming The Elder Scrolls Online. Much like the Ebonheart Pact, the Daggerfall Covenant united races that were commonly known as old enemies. 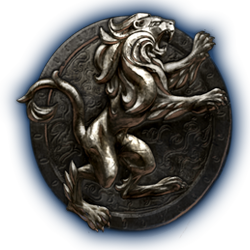 Due to the events in Cyrodiil, trade routes, the region’s main source of income, were disrupted. This caused poverty and suffering, and ultimately united the people under one banner. The Daggerfall Covenant stretched over the provinces of High Rock, Hammerfell and Orsinium. Its capital was the city of Wayrest, built on two shores of the Bjoulsae River in High Rock. The faction is lead by the High King Emeric. The main reason the Daggerfall Covenant was established was to return the once prosperous trade back to the region. This could not be done as long as an enemy sat on the Ruby Throne. Merchant king of Wayrest, Emeric, took action and united the previously warring races of Breton, Redguard and Orc. He earned the trust of the kings of the High Rock, earned alliance of the Redguards by a diplomatic marriage and, finally, made a war treaty with the Orcs. Living deep within and around the Alik’r desert, Redguards were renowned warriors, both athletic and prodigiously talented. They valued honor and dignity above all else; their sacred purpose was to preserve their ancient traditions and prove their strength, surviving in the harsh environment. Mages were highly distrusted in their society. The capital of the Redguards was the great city of Sentinel. Orcs were often referred to as barbarians and even beasts. They, however, were fearless warriors, who followed a code of honor, forged in centuries of endless warfare. The quality of Orcish blacksmithry was known throughout Tamriel.